The following information is written in Jennifer’s own words with some small edits from me. If you have been following this story, I believe you will find Jennifer’s observations quite fascinating. Since Cleopatra was a kitten, she would go into severe “depression episodes” if there were any types of changes to her environment. She became completely despondent, curls into a ball, her fur becomes dull, eyes, glassy, stops eating, and on several occasions will start to dry heave. In the past couple of years, we tried flower essences and the homeopathic remedy Lycopodioum. This combo seemed to stabilize her up until recently, when we decided to introduce Chloe, another cat, into the family. Having Chloe come into the house once again put Cleo into one of her episodes. The trigger seemed to be the occasion when Chloe bullied Cleo away from her food and then ate the food herself. Cleo immediately became completely despondent and curled herself into a ball in our spare bedroom. [All the old symptoms were back,] and the remedies that had previously worked did ot work when I gave them to her. So I contacted Nedda in hopes that we could help Cleopatra overcome her depression and possibly integrate Chloe into the family. After communicating with Cleo, Nedda realized that her depression went unusally deep – that Cleo seems to “melt” into herself. This was a geat way of putting it because that was exactly what it looked like to me. Nedda suggested a healing for Cleo, which we scheduled for 10 a.m. the next morning. I was preparing to leave the house just when the healing session was to begin. Cleo was still in her spot on the bed, still in her despondent state. At 10 a.m., I saw Emme, Cleo’s best friend and protector, jump up on the bed, put her paws around Cleo’s neck, and begin to groom her. When Nedda told me of her own experience of the healing on the phone the next day, she said that Emme came energetically into the healing space to support Cleo as the healing session began. I returned home in the evening to find Cleopatra greeting me at the door, something she hadn’t done all week. I picked her up and noticed immediately the change in her eyes and fur, the first two things to go when she becomes depressed. Her fur was back to being shiny and her eyes were bright. Cleo wanted to go outside. After I let her out, she started acting in an unusual way. At first I thought it might have been becasue Chloe was also outside, but even so, up until this night, Cleo had been OK with Chloe outside the house. Cleo’s unusual behavior that night was to refused to come back into the house. She seemed alert, but distant. She sat on our deck for awhile staring straight ahead. Then she disappeared off our deck and would not come when called, which is very unusual for her late in the evening. Finally, my husband took a flashlight and we found her at the bottom of the hill behind our house staring up at the house. Eventually, Cleo did come back to the door on her own. When she came insight, it was like a night-and-day change in her, as if she had been processing things while outside. Cleo walked into the house in a very alert state and for the next hour proceeded to run and play with all her favoite toys. When she’s really happy, she does running somersaults onto our sofa. When I saw her do 2 of those in a row, I knew she was back to her old self! I literally sat in amazement in the living room watching her and playing with her. It was such a drastic change from just that morning that it took me some time to process! Before Cleopatra’s healing, she had stopped coming into our master bedroom, a place she loves. Chloe had then taken over the bed in that room. The day after Cleopatra’s healing, she entered the master bedroom for the first time in over a week. 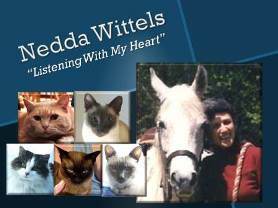 During the initial Animal Communication session, Nedda had told me that Chloe had told Cleopatra she was no longer welcome in that room. Now Cleo had returned to that room. Although Chloe’s presence is still upsetting for her, the changes I have seen in Cleo have held for two weeks. Chloe is still challenging Cleo, Cleo is not regressing back into her depressed state. She remains very alert and her eyes are shiny and bright. Her fur is looking great. This is huge considering the fact that Chloe has upped the ante with her and has tried to be even more domineering this last week. It’s amazing to see that even though Cleopatra is visibly upset, she is holding her own and not regressing, not withdrawing into herself again. Even though Cleo has made tremendous progress, [I feel that] the stress of Chloe’s presence and behavior is too much for Cleo to handle. We [my husband and I] felt it would be best if Chloe went to live with my mother. We are very optimistic about Cleo’s progress and hope we can continue to work with Nedda on her issues. Nedda . . . [was guided by the beings she works with in her healing sessions to make] some observations about mercury toxicity and possible vaccination reactions that we want to investigate further. Hopefully, with the combination of the healing and these other issues taken care of, Cleopatra’s life is going to be a much calmer, happier experience. We thank Nedda so much for helping to connect these pieces to the puzzle [of Cleo’s unusual behavior]!